Celebrating the holidays in New York is an experience unlike any other. 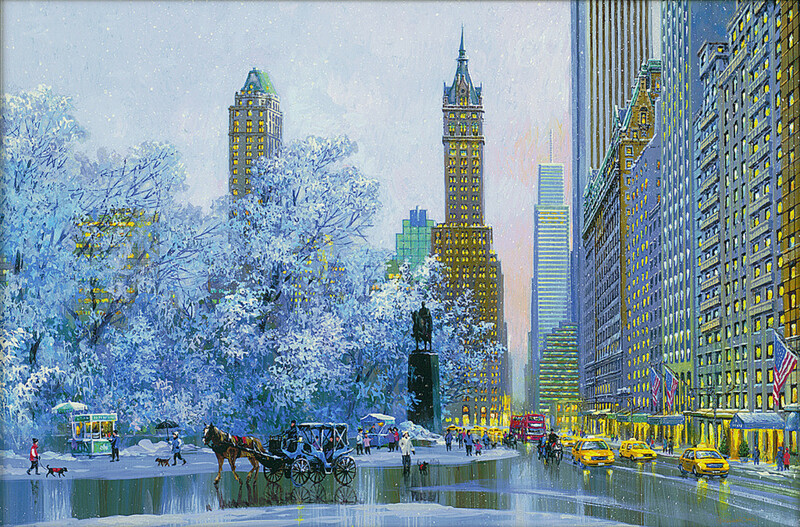 Not everyone can make the journey to the Big Apple for the winter, but artist Alexander Chen offers a different way to experience the metropolis. The famous city left a lasting impact on Chen. Before he was 40 years old, Chen had never seen snow. The first time he experienced snow was in New York City in the early ‘90s. “After that, I always came back to New York City and went to Central Park, and I like the feeling of winter, I like the snow, I like the white, I like that kind of thing,” Chen says. 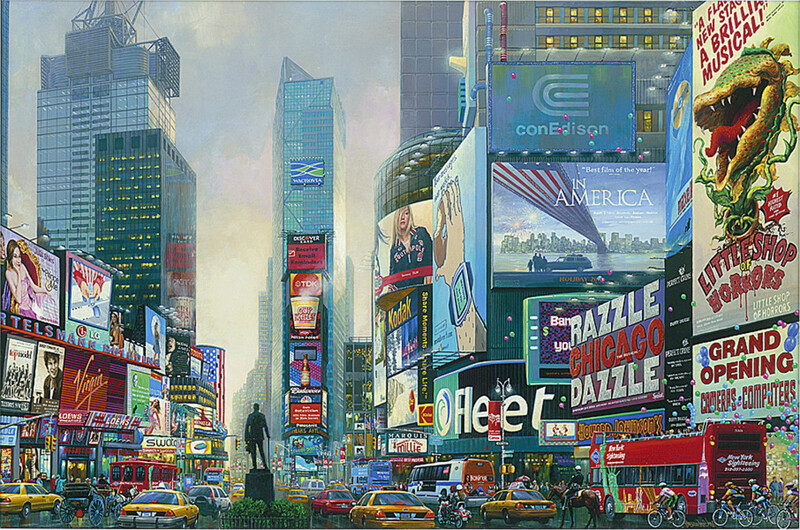 Chen used his hyper-realistic style to document the sights and colors he experienced in New York City, transporting viewers to various locations through intricate details and beautiful colors. The following images available during Park West Gallery’s Holiday Sale demonstrate Chen’s ability to capture a city’s heart and soul. Established in 1857, Central Park is a National Historic Landmark that spans 843 acres and receives an estimated 37.5 million visitors annually. 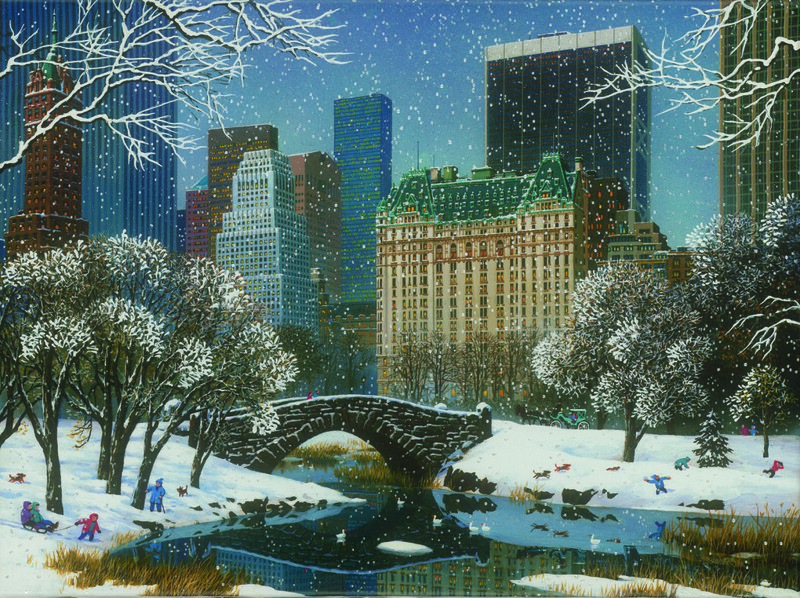 In this work, Chen shows the beauty of a New York winter as snow lazily falls at the Gapstow Bridge. 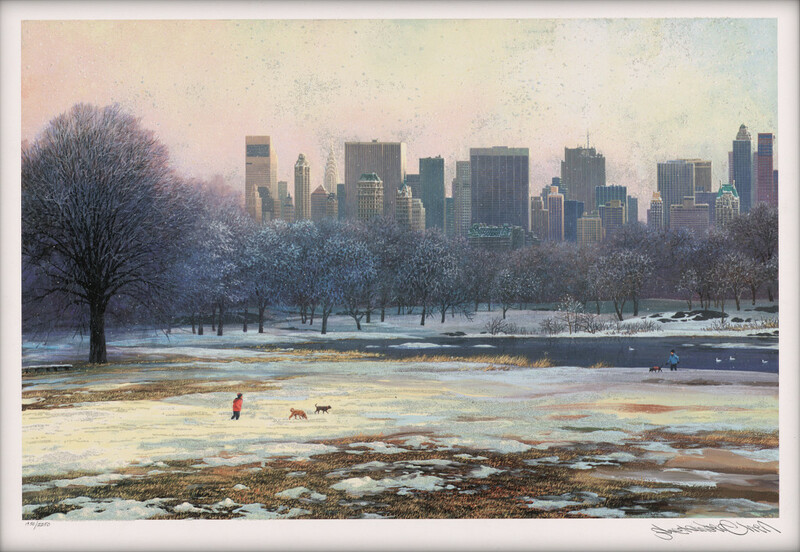 Chen’s hyper-realism shines in this work depicting New York’s skyline from a clearing in Central Park. His inclusion of a couple of dog walkers braving the cold help demonstrate the immensity of the park and the urban sprawl surrounding it. The shining lights of the New York buildings are contrasted by the whiteness of the snow-covered trees in this view of Central Park’s south end. A statue, most likely a Simon Bolivar monument, stands at the center of the work while people walk about or enjoy horse-drawn carriage rides. Washington Square Park is a 9.75-acre park located in Lower Manhattan in Greenwich Village. 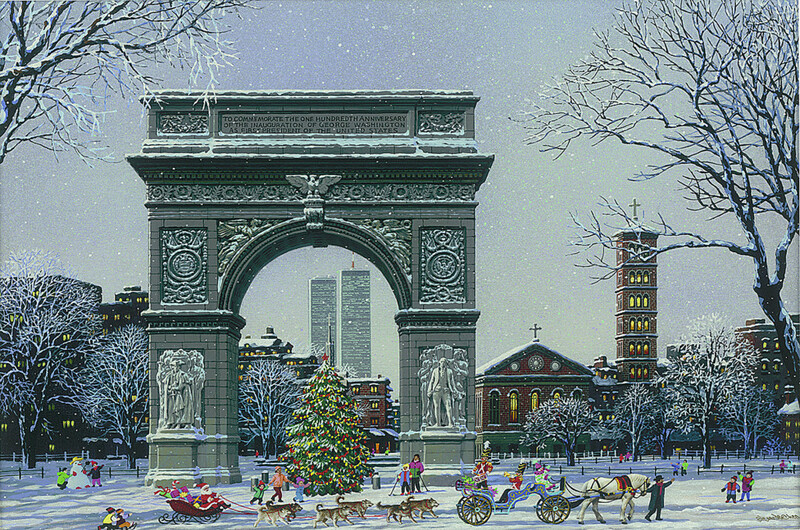 Chen’s wintery rendition of the park is dominated by the Washington Square Arch, but also features fun inclusions like Santa Claus and his sled pulled by dogs and a large Christmas tree. This beautiful church is the Cathedral of St. Patrick, and is a fine example of Neo-Gothic architecture. 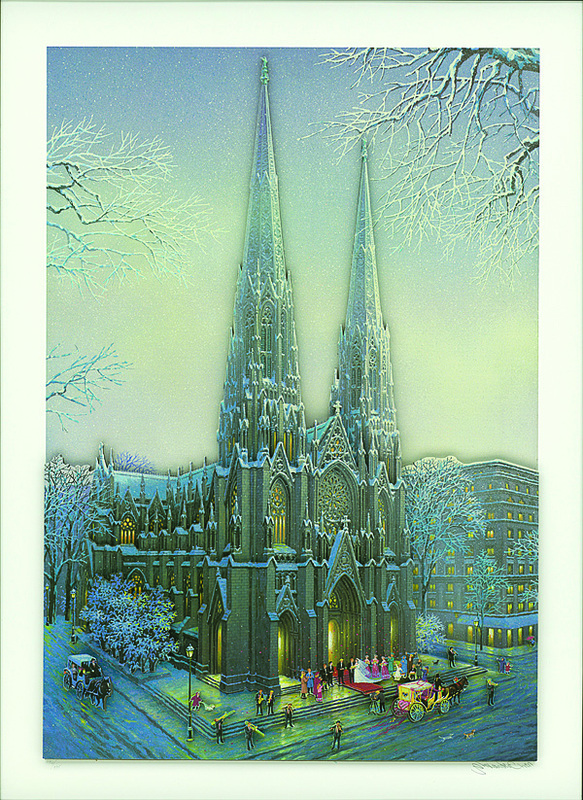 The church, located in Manhattan, is a notable landmark in New York, and Chen only enhances its beauty with this wintertime artwork. The Chrysler Building, located on the east side of Midtown, is a famous Art Deco-style skyscraper and an iconic part of New York’s skyline. 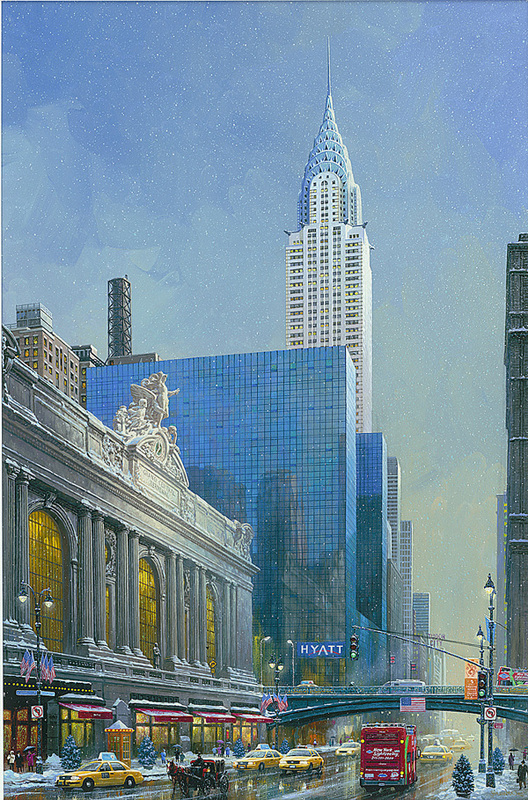 Chen faithfully captures the Manhattan building’s architecture while simultaneously portraying another famous landmark: Grand Central Station. Times Square is located in Midtown Manhattan at the junction of Broadway and Seventh Avenue. 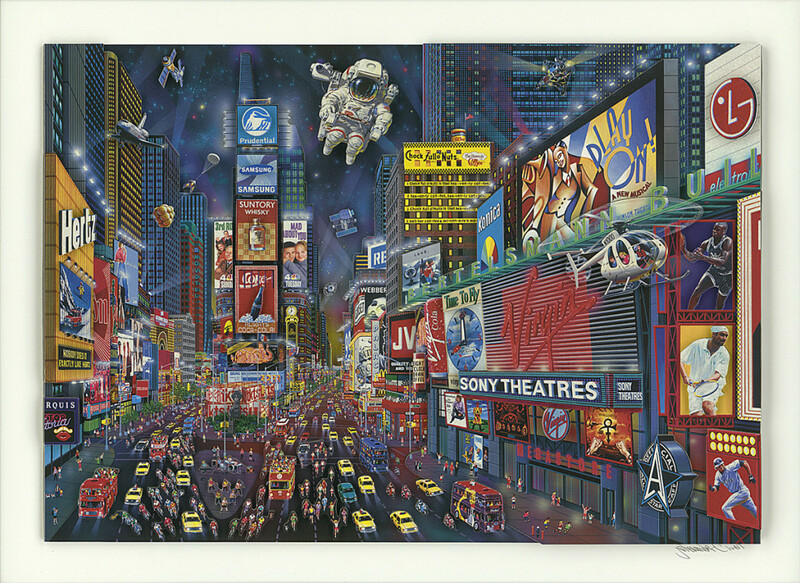 Chen says he takes great care when depicting the bustling, ad-laden intersection. 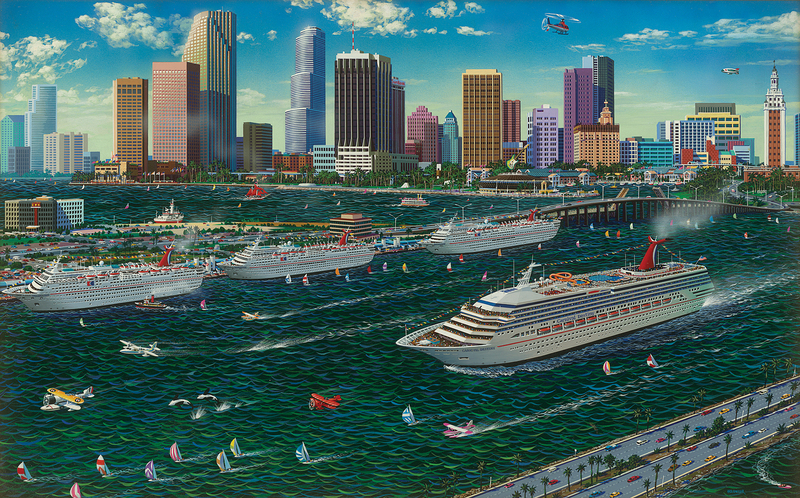 Chen’s oeuvre portrays locations across the globe. 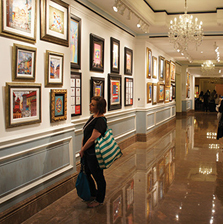 Be sure to view the Alexander Chen collection at Park West Gallery.